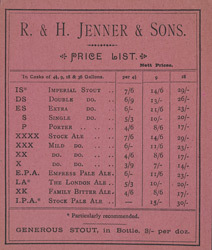 The brewing firm of RH Jenner & Sons was founded in 1787 in Southwark, London. At that time most ale brewing was done by individual publicans, but tighter legislation introduced in 1869 led to the growth and eventual dominance of independent brewers such as Jenner. Smaller inns were gradually forced to close and brewers themselves took control of public houses.